The histological features of cystoid macular edema in an early stage are demonstrated in the eye of a 54-year-old patient with an active ciliary body melanoma. Separation of the posterior vitreous face and the inner limiting membrane with accumulation of an exudate in the resulting space, petaloid folding of the inner retinal layers, swelling as well as microcystoid degeneration of Henle's fiber layer, and vertical folding of the outer retinal layers with separation of the central cones from the pigment epithelium are observed. The occurrence of cystoid macular edema (CME) is not limited to situations following ocular injuries1'1 or surgery.1 CME also can be idiopathic,4 occur after topical epinephrine5 and systemic nicotinic acidj medication, or be associated with papilledema'' or choroidal melanoma,""'1 for example. Careful histopathological study of CME in its different associations is one method that finally will lead to a better understanding of CME's basic nature. With this aim, the present histopathological study of CM E associated with ciliary body melanoma is presented. This 54-year-old white male was first seen on 1 0-30-80 with a history of painless vision loss in his left eye for about four weeks. The patient was of good general health, but he smoked two packs of cigarettes a day. Vision in the left eye was 20/400 with his glasses, but this could be improved to 20/60 by adding a +1.OO sph lens. External examination immediately revealed a dark brown tumor on the limbus of the left eye between 12 and 2 o'clock. The tumor looked inactive, was very superficial, and could be moved on the limbus with a cotton applicator. However, in back of this limbal tu mor there was an independent intraocular t u mor of similar color that involved the angle as well as the iris root and originated in the ciliary body. This brown tumor indented the lens at its equator. Localized cortical cataractous changes were seen next to this indentation, and these extended into the posterior cortex. Enlarged blood vessels were seen on the outside of the sclera in the region of the tumor. The central retina did not look normal - it was slightly obscured by the lens changes and by additional clouding of the deep vitreous overlying the fovea. CME was suspected. A fluorescein angiogram showed diffuse late staining in the foveal region, but it was not sufficientlyclear to allow for a definite diagnosis. The limbal tumor was removed and diagnosed as inactive junctional nevus. The ciliary body tumor was measured by transillumination and observed for eight months. It almost doubled in size - and its expansion was in a posterior direction, mainly. In view of the patient's normal right eye, good general health, and relatively young age, enucleation was advised. During the time of observation the patient was without medications or eye drops - except for the dilating drops used for fundus examinations. Surgery was performed under local anesthesia on 7-10-81. The eye was fixed in 10% buffered formalin immediately after its removal. The eye was normal externally at gross examination. The dark brown ciliary body tumor was found to measure 8 X 6 X 6 mm. The lens was clearly pushed aside. The vitreous was not detached, but it was quite fluid, and most of it ran out when the eye was opened. The f oveola was not visible due to a round and sharply limited layer of gray substance on its inner surface. Radiating from this round layer were grossly visible folds of the inner retina in a petaloid arrangement. A cross section of the eye in an oblique parafoveal plane (Figure 1) showed the ciliary body tumor indenting and slightly dislocating the lens. 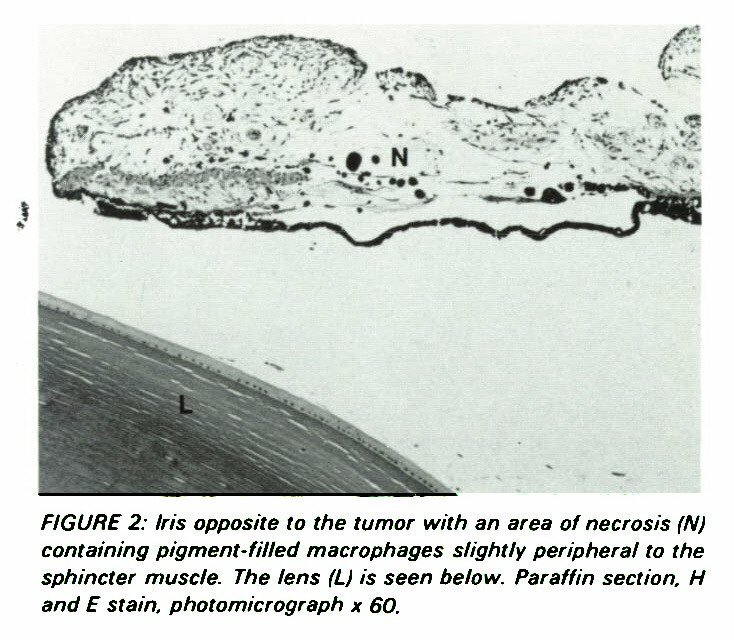 The tumor was composed of pigmented cells and exhibited large cystoid spaces due to necrotic liquefaction (Figure 1). Most of the tumor cells were spindle shaped, and many had nucí eoi at ed nuclei of relatively large size and round shape. The lens had localized cortical cataractous changes in the area of the tumor indentation. Diffuse infiltration with mononuclear inflammatory cells was seen in the iris and ciliary body. The blood vessels in the choroid and ciliary body as well as the anterior ciliary arteries in the region of the tumor were enlarged. A vertical fold of the outer retinal layers was recognized in the temporal retina superior to the fovea (Figure 1). A focus of necrosis was found in the nasal iris opposite to the melanoma Figure 2). 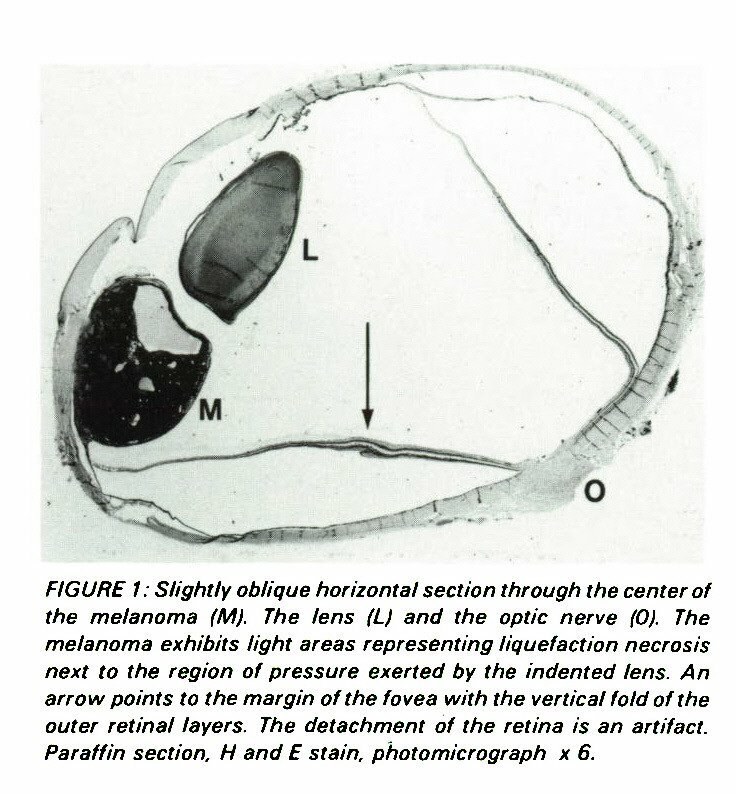 FIGURE 1 : Slightly oblique horizontal section through the center of the melanoma (M). The lens (L) and the optic nerve 0). The melanoma exhibits light areas representing liquefaction necrosis next to the region of pressure exerted by the indented lens. An arrow points to the margin of the fovea with the vertical fold of the outer retinal layers. The detachment of the retina is an artifact. Paraffin section. H and E stain, photomicrograph ? 6. FlGURE 2: Iris opposite to the tumor with an area of necrosis (N) containing pigment-filled macrophages slightly peripheral to the sphincter muscle. The lens (L) is seen below. Paraffin section, H and E stain, photomicrograph ? 60. 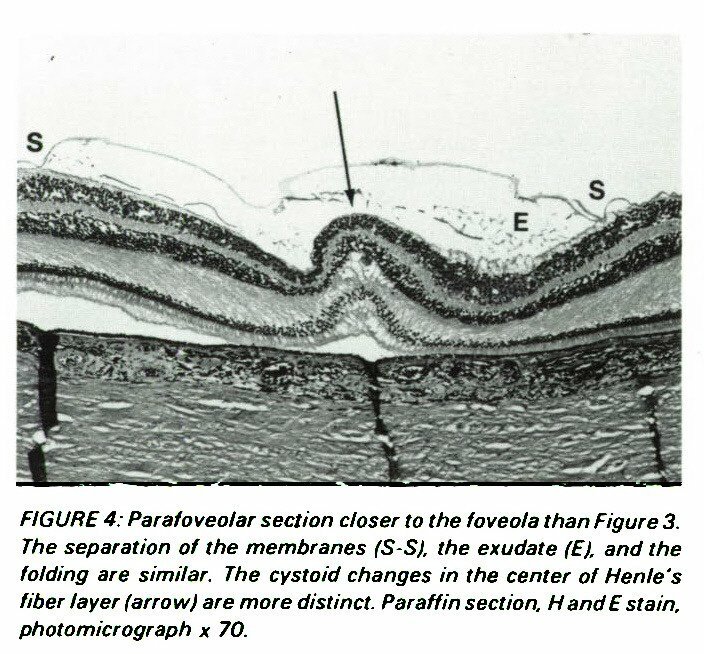 FIGURES: Parafoveolar section of the retina showing separation of the posterior hyaloid and inner limiting membranes from the nerve fiber layer (S-S). The separated membranes form a space filled with loose exúdate (E). The folds of the inner and outer retinal layers coincide in this section. Henle's fiber (H) is swollen and shows microcystoid changes (arrow) in the center. The fold of the outer layers causes detachment of the cones (D). The choroid is congested. Paraffin section, H and E stain, photomicrograph ? 70. FIGURE 4: Parafoveolar section closer to the foveola than Figure 3. The separation of the membranes (S-S), the exúdate (E), and the folding are similar. The cystoid changes in the center of Henle's fiber layer (arrow) are more distinct. Paraffin section, H and E stain, photomicrograph ? 70. The fovea! 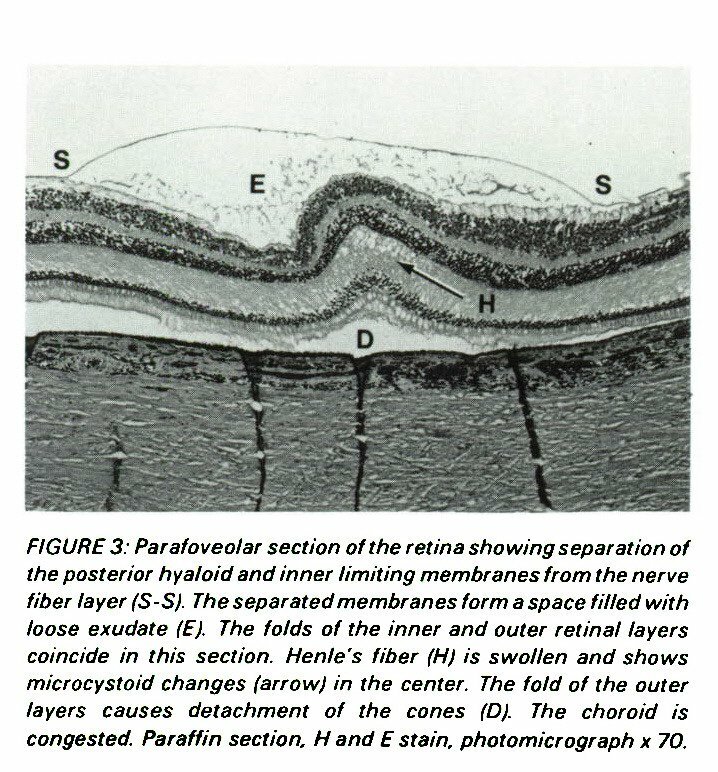 retina exhibited separation of posterior hyaloid and inner limiting membranes from the nerve fiber layer of the retina in the foveal region, resulting in a cyst-like formation (Figures 3, 4, & 5). The gray appearance of this zone of separation at gross examination was explained by an accumulation of toóse sero-fibrinous exúdate. The nerve fiber, ganglion cell, and inner plexiform layers of the foveal region exhibited folding that was the histologie equivalent of the star-like swelling in the foveal zone that had been seen grossly. Henle's fiber layer showed edematous thickening with microcystic degeneration in the very center (Figures 3, 4, & 5). The vertical retinal fold seen in Figure 1 was found running through the foveola and caused elevation of the outer retinal layers with separation of the cones in the center of the fold from the pigment epithelium (Figures 3, 4, & 6). The cones in the center of the fold had degenerative changes (Figure 5), and the number of nuclei in the outer nuclear layer was decreased in the very center of the foveola Figure 5). The pigment epithelium was normal. The choroid appeared thickened due to vascular congestion (Figures 3, 4, & 5). A diagnosis of an active spindle B cell melanoma of the ciliary body with secondary chronic uveitis and a mild form of CME was made. FIGURE 5: Higher power view of a section directly next to the foveola - with two artificial wrinkles in the section - shows one of the sharp folds of the inner layers (Fl near the center of the petaloid formation. 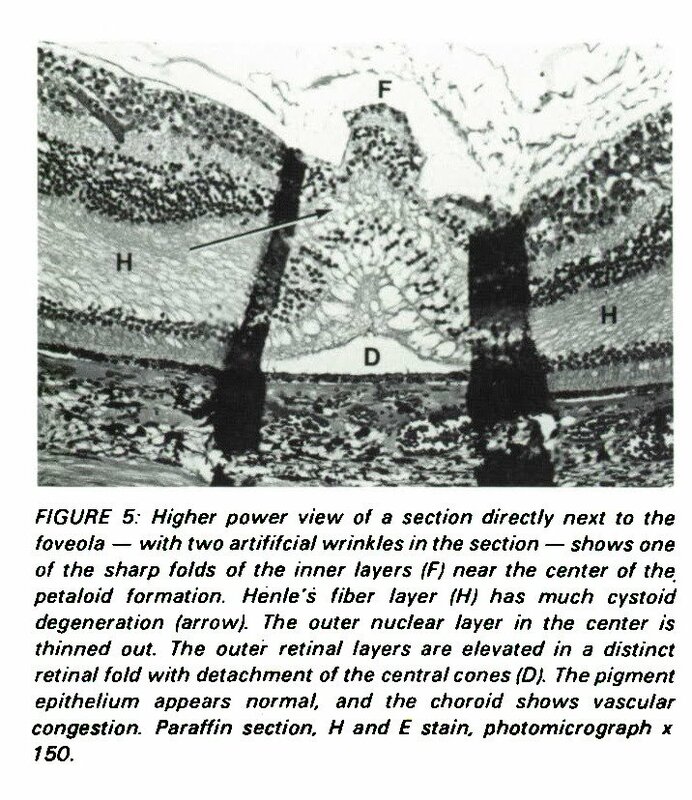 Henle's fiber layer (H) has much cystoid degeneration farrow}. The outer nuclear layer in the center is thinned out. The outer retinal layers are elevated in a distinct retinal fold with detachment of the central cones (D). The pigment epithelium appears normal, and the choroid shows vascular congestion. Paraffin section, H and E stain, photomicrograph ? 150. The present eye with a ciliary body melanoma exhibits a fold of the outer retinal layers running through the fovea in a vertical direction and causing separation of the central cones from the pigment epithelium. In the foveola this is associated with separation of the inner limiting membrane, accumulation of a sero-fibrinous exúdate, star-shaped folding of the inner retinal layers, and swelling as well as microcystoid degeneration in Henle's fiber layer, This pathological picture is typical for early CME after surgery or trauma.2'3 It is of the greatest importance to state, that these changes did not result in a clinically obvious picture of CME by ophthalmoscopy as well as by fluorescein angiography. This was partly explained by the presence of much exúdate in the preretinal vitreous, which prevented a clear view. The present case serves to show that this typical pathological picture of an early stage of CME is not limited to situations with surgical or traumatic events, but it also can occur in an eye with a neoplasm located opposite to the fovea in the temporal ciliary body. This neoplasm was active. It contained areas of necrosis and was associated with an area of distant necrosis in the iris opposite to the tumor. It also was associated with a chronic iridocyclitis. Furthermore, the active neoplasm had caused direct disturbance of the lens and the vitreous. There were no signs of vitreous traction,9 but the vitreous body was liquified, and it was suspected to contain plasmoid exudation. The clinically observed decrease of central vision was explained by the foveal changes, mainly. It is interesting to note, that pressure between tumor and lens had resulted in localized liquefaction necrosis in the melanoma and histologically visible cataractous changes in the indented part of the lens cortex. The separation of the inner limiting membrane in the fovea associated with a delicate sero-fibrinous exúdate has been seen before in early CME,2 but it has never been demonstrated as welt as in this case. It is considered part of the process - and it immediately reminds the clinician of the diffusely opaque layer that is seen over the central retina in many cases of CME. The grossly visible star-figure again resembled in shape and distribution the petaloid pattern of the fluorescein view seen in many cases of CME.2'J The histological findings again indicate that this was a result of folds of the inner retinal layers on top of the swollen Henle's fiber layer with its cystoid changes. The histological evaluation of cases with different stages of CME under different conditions has already brought some insight, cleared some of the mystery, and ended some of the speculations that were part of the clinical view of CME. These continuing studies will end an era, when ophthalmologists have given in to "the endless art of admiring the problem"'0 - by simply accepting the frequent occurrence of CME. Good pathological description is the first step. Experimental studies will have to supply the second step on our way to complete insight. There is new evidence," that CME very similar to t hat seen in man, also can occur in monkeys under experimental conditions. 1. Wolter JR: Foveal pathology fol lowing anterior segment injury Ophthalmic Surg 12:661-665, 1981. 2. Wolter JR: Vertical folds of central retina and choroid in sudden ocular decompression. Ophthalmic Surg 12:1 90-1 94, 1981. 3. Wolter JR, Croasdale RE, Bahn CF: Reactions to an anterior chamber lens - two years after implantation. Ophthalmic Surg 1 1 :794-800. 1980. 4. Gass JDM: Stereoscopic Atlas of Macular Diseases, ed 2. CV Mosby Co, St Louis, p 260, 1977. 5. Kolker AE, Becker B: Epinephrine Maculopathy. Arch Ophthalmol 79:552-562, 1968. 6. Wolter JR: The histopathology of cystoid macular edema. Albrecht von Graefes Arch Klin Exp Op/)f/ia//m>/216:85-101, 1981. 7. von Domarus D, Hinzpeter EN: Zystoìdes Makulaodem über einem malignen Melanom der Aderhaut, KUn Monatsbl Augenheilkd 172:75 1-756, 1978. 8. Apple DJ, Rabb MF: Clinicopathologic Correlation of Ocular Disease, CV Mosby Co, St Louis, p 327, 1978. 9. Wolter JR: Cystoid macular edema in vitreo-retinal traction, Ophthalmic Surg 12:900-903,1981. 10. SideyH: Time 1 187):29, 1981. 11. Irvine AR: Extracapsular cataract extraction and pseudophakos implantation in primates: A Clinicopathologic study. Trans Am Ophthalmol Soc, 78:780-807, 1980.